Q1. Name one routing protocol that sends periodic updates. Answer: RIPv1, RIPv2, and IGRP all send periodic updates. Q2. What is an incremental update, and how often is it sent out? Answer: An incremental update is an update that is sent out only when there is a change in the network. It contains only the information about the change. The change could be either the loss of a network or the addition of a network. Protocols that send incremental updates are link-state protocols, such as OSPF, IS-IS, BGP, and EIGRP, although not only link-state protocols will send incremental updates. Q3. What is the routing algorithm used in OSPF? Answer: The routing algorithm used in OSPF is the Dijkstra algorithm. Q4. State one method by which a link-state routing protocol attempts to reduce the network overhead. Answer: Link-state routing protocols reduce network overhead by sending only incremental updates, or periodic updates with a very long interval. The updates contain information about the links connecting local routers rather than route information that is calculated as part of the routing process. Q5. Distance vector routing protocols naturally summarize at which boundary? Answer: Distance vector routing protocols naturally summarize at the NIC or major network boundary. They do this by following the first octet rule. Q6. Which routing protocol technology uses the Bellman Ford algorithm? Answer: The routing protocol technology that uses Bellman Ford is distance vector technology. Q7. Give three reasons why RIPv1 has problems with working in a large network. It has a maximum hop count of 15. It sends updates of its routing table out of every interface every 30 seconds, which increases the network overhead on a network and leads to link congestion. To avoid routing loops, it uses holddown and poison reverse, and thereby increases the time that it takes to propagate the changes in the network. Q8. What is the Dijkstra algorithm used for? Answer: The Dijkstra algorithm is used to calculate the shortest path first from the topological database. It examines the topological database and creates the routing table with the best path to each remote subnet. If there is more than one equal-cost path, it will load balance among them. Q9. What is the destination address of the distance vector periodic update? Answer: The destination address of the distance vector periodic update is 255.255.255.255 (the broadcast address). Q10. State one major difference between a classful and classless routing protocol. Q11. In the routing table, a field indicates the source of the routing information. If the field showed the letter C, what would this mean? Answer: A field showing the letter C would mean that the network is directly connected. Q12. In the routing table, how is the next logical hop indicated? Answer: In the routing table, the next logical hop is indicated by the word via followed by an IP address. This is the address of the next logical hop. Q13. 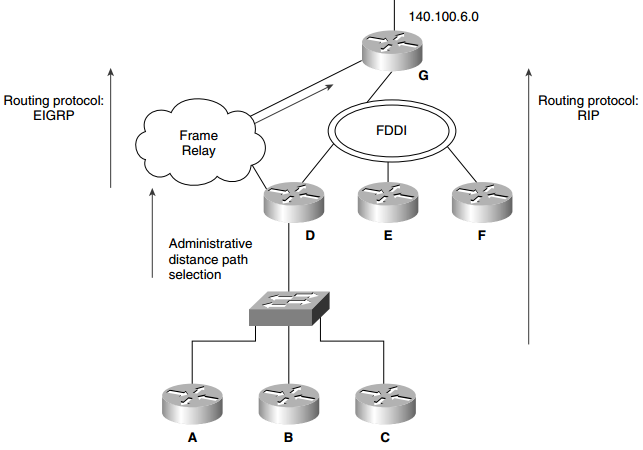 Cisco distinguishes between the routing and the switching function—what is the difference? Answer: The routing function is how the router learns the logical topology of the network. It decides whether the datagram can be routed, which path to select if there is a choice, and to which outgoing interface to queue the datagram. It operates at Layer 3 of the OSI stack. The switching function is the forwarding of the frame from the inbound interface to an outbound interface. It operates at Layer 2 of the OSI stack, not at Layer 3, like a router. A LAN switch connects two or more LAN segments. It uses a table of MAC addresses to determine the segment on which a frame needs to be transmitted; if it is on the interface that the frame received, then the frame is dropped. The switch listens to all traffic on the interface, at Layer 2, while the router looks at only the MAC address of a multicast group of which it is a member, a broadcast, or its own individual MAC address. Switches operate at much higher speeds than routers and can support new functionality, such as virtual LANs. Q14. State the two ways that an outgoing interface is selected as the preferred path. Q15. What is administrative distance? Answer: Administrative distance is the mechanism used by the routing process to select a path offered by two different routing protocols. The administrative distance is a set of values, in which a value is given to each IP routing protocol. This allows a hierarchy to be established so that when multiple protocols offer a path to the same remote network, one path can be chosen. The path that is chosen will be the one offered by the routing protocol with the lowest administrative distance. The administrative distance can be manually configured. Q16. If IGRP has three paths to a remote network in which each path has an equal metric, what will happen? Answer: If IGRP sees equal cost paths to a remote network, it will load balance between those paths by default. Q17. Name the interior IP routing protocols that send the mask with the routing update. Answer: The interior IP routing protocols that send the mask with the routing update are EIGRP, OSPF, IS-IS, and RIPv2. Q18. Name the interior routing protocol that sends a routing update on a Cisco router every 30 seconds by default. Answer: The routing protocol that sends a routing update every 30 seconds is RIP. Q19. Does VLSM require a classful or classless routing protocol, and why? Answer: VLSM requires a classless routing protocol because it needs the subnet mask to be sent with the update. Q20. State one of the characteristics of a classful routing protocol. It summarizes at the network boundary. Routes exchanged between foreign networks are summarized to the NIC number. Within the same network (NIC number), subnet routes are exchanged by routers. All the interfaces on all the routers within a NIC number must share the same subnet mask. VLSM is not possible within the network. Q21. A distance vector routing protocol uses the mechanism of poison reverse—what is this? Answer: When the routing process suspects that a route in its routing table is no longer valid, it sets the metric so high for that route that it renders it unusable. This will be propagated in the routing updates to other routers. Q22. Name two distance vector routing protocols. Answer: Distance vector routing protocols include RIPv1, RIPv2, IGRP, and EIGRP (an advanced distance vector routing protocol). Q23. Name two link-state IP routing protocols. Answer: Link-state IP routing protocols include OSPF, IS-IS, and EIGRP (an advanced distance vector routing protocol, with some link-state characteristics). Q24. Describe the mechanism of split horizon. Answer: Split horizon is a routing technique in which information about routes is prevented from exiting the router interface through which that information was received. Splithorizon updates are useful in preventing routing loops. Q25. What is the command syntax to empty the Cisco routing table of all its routes? Q26. What does 0.0.0.0 signify in an IP routing table? Answer: 0.0.0.0 is used to signify the default route in the routing table. Q27. What is the command to show whether a specific network, such as 141.131.6.16, is present in the routing table? Q28. 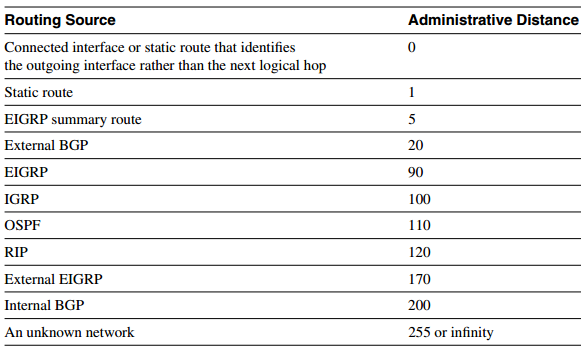 What is the next logical hop in the routing table? Answer: The next logical hop in the routing table is the address of the interface to which traffic should be sent for it to reach the remote network. The address is taken from the source address of the routing update that provided the remote network.